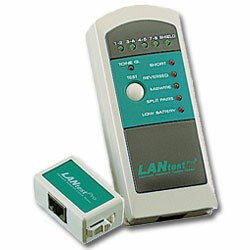 The LANtest Pro is a small hand-held tester that enables the user to quickly read the status of Ethernet twisted pair cables. It tests for faults such as open circuits, shorts, crossed pairs, reversed pairs and split pairs in seconds. The Tone generator function can send a signal through your installed cables and the probe can then trace the cable to locate the fault. The LANtest Pro includes one master unit and one remote unit easily operated by one person testing patch cords or installed cables. The small remote unit is designed to slip into the master unit to prevent loss or damage.